This building showcases two ape species, orangutans and siamangs, and six monkey species including colorful mandrills. 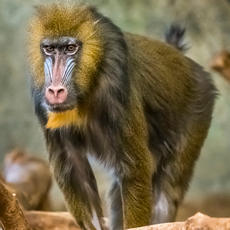 Mandrills are the largest of the monkey species, with extremely colorful blue and red skin. Mandrills live in troops, headed by a dominant male. Primates of the World building.